Immediate service for refrigerator repair. Fast, same day service for washer, dryer, oven, dishwasher, water heater, ice maker, and microwave repair. Call Appliance Repair Service of Sarasota to speak with a live operator. We’ll have an appliance repair man on his way within minutes. Same day service on all appliance brands, gas and electric. Professional workmanship and friendly customer service make Appliance Repair Service of Sarasota a smart choice for appliance repair in the Sarasota area. All of our technicians are skilled professionals and have been repairing appliances for years. At Appliance Repair Service of Sarasota, appliance repair is all we do and we have what it takes to get your machine repaired quickly and operating like new again. Since 1978, we have been providing quality appliance repair service to our customers. We are punctual and mindful of your schedule and put a priority on being on time. Our staff is polite, careful, and on time. We practice care and courtesy while servicing your appliances to insure that you and your home are always respected. •Service within minutes, not days! Expert Service on: Whirlpool, Sub Zero, Sears, GE, Frigidaire, Amana, Jenn Air, Kenmore, Kitchen Aid, Roper, Samsung, Sanyo, Jenn Air, Kelvinator, Vinotemp, Wards, Whirlpool, Admiral, Amana, Estate, Frigidaire, Gaggenau, GE, Gibson, Goldstar, Kenmore, KitchenAid, LG, Tappan, Uline, Hotpoint, Montgomery, Wards, Norge, Caloric, Coldspot, Crosley, Dacor, Danby, Electrolux, Emerson, Panasonic, Magic Chef, Maytag, Scotsman, Sears, Signature, Speed Queen, Sub Zero, Wine Enthusiast, Wolf, and all other brands. Thank you from Appliance Repair Service of Sarasota! Licensed, bonded, insured, drug free work place. All employees have passed backround checks. Locally owned and operated for over 30 years. It is usually not a good day when an appliance breaks down. Though appliances are very well made and long-lasting they are still machines, and all machines will, no matter how well made, sooner or later stop working. The food in the refrigerator is not cold enough. The dryer will not tumble. The washer will not spin or the washer will not drain. If you live in Sarasota, University Park, Lakewood Ranch, Osprey, Siesta Key, Longboat Key, or anywhere else close by and you need your refrigerator or appliances repaired, you can call us anytime of the day. We will come to you the same day and fix it on the spot. Before calling us try to find out what’s wrong with your appliance. If it’s a refrigerator, is the problem fresh food warm, ice melted, icemaker not making ice, fresh food freezing, refrigerator leaking water, refrigerator making noise, or refrigerator not cooling? Make sure your refrigerator is set to the mid setting and has been plugged in and turned on for at least 24 hours. Many refrigerator problems have to do with automatic defrost system. Check to see if there is a lot of snow buildup on the back wall of the freezer behind the frozen food. Snow on the back wall behind the frozen food is indication that the automatic defrost system has ceased to function properly. This snow blocks the air flow and causes the food temperature to rise. The frosty coil operates at -20°F which is very cold, but the cold air needs to circulate across the food by means of the evaporator fan. When the cold coil is plugged with snow, the cold air can not circulate. This is the entire purpose for automatic defrost system. To keep the air circulating. Also check to see that the hot fan underneath the refrigerator, the cold fan in the freezer, and a compressor motor, are all running. The refrigerator compressor motor looks like a bowling ball underneath the refrigerator. Basic refrigeration cycle consists of two fans and one compressor. These three motor should all be running during the cooling function. To find out if your freezer is cold enough, put a half gallon of ice cream in the freezer. Residential freezers run it 0°F. If the freezer is at the correct temperature the ice cream will be solid and not so hard that it breaks the scoop. Proper temperature of the fresh food section is 36°F. If the fresh food is over 40°, then the machine is out of the refrigeration zone. If the problem is with the washing machine then the description of the problem could be, washer not draining, washing machine not spinning, leaking water, not filling, no cold water, or won’t turn on. Washing machines first fill up, then wash or agitate, then drain, then spin. Also washers will not run properly with the lid, or door not closed properly. Check to see that the basic washer functions are operational. If the problem is with your clothes dryer, the problem could be not tumbling, not starting, dryer not heating, dryer noisy, broken belt, squeaking, or clothes taking too long to dry. Clothes dryers operate in three basic principles. The three dryer principles are heat, tumble, and airflow. If the dryer heats, even a little, and clothes are going around or tumbling, then go to where the air of the dryer exits the building. Run the dryer in heating mode and make sure a lot of hot air is leaving the building. If you don’t have a lot of hot air leaving the building when the dryer is running, then you have a clogged or crushed vent. A clothes dryer requires a 4 inch unrestricted vent from the back of the dryer to the outside of the building. Other problems could be, hot water runs out too fast, or water heater not heating. Dishwasher not starting, dishwasher not draining, controls won’t program, fault codes, or microwave not heating, not cooking, or noisy. Make sure the machine is getting electricity. Plug something else into the power outlet to see if that outlet has electricity. If the plug has power and all of the controls are set to operate properly, then only thing left to do is call the appliance repair man. Be sure to call only a highly skilled qualified technician. Repairing appliances is often complicated and sometimes dangerous. Probably that kind of work should be left for someone knowledgeable. You could call Appliance Repair Service of Sarasota. Our local phone number in Sarasota is (941) 366-8844. 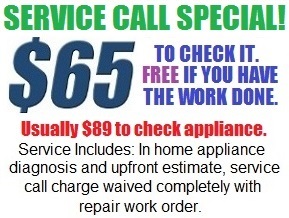 Right now we have a $65 service call special. A technician will arrive at your home the same day you call to diagnose your appliance. He will always give you an upfront estimate before any work is done. We carry spare parts on the trucks so the service man can fix it while he is there. If you decide at that time to get your machine repaired, then the service call is free.